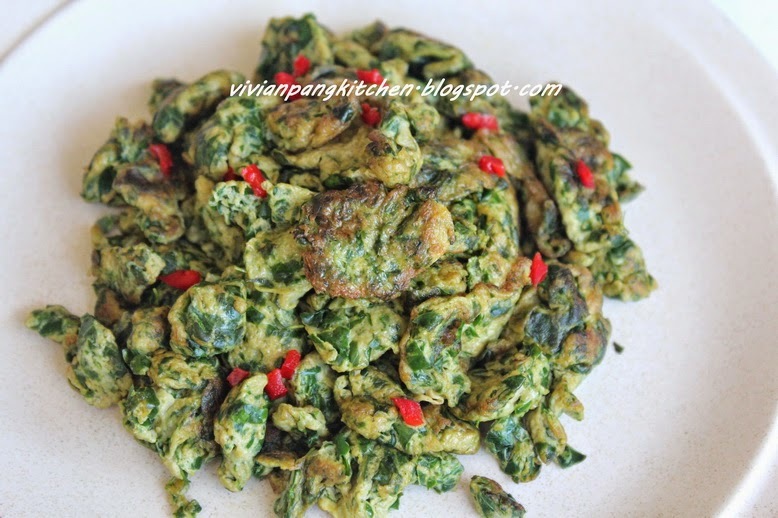 This dish is inspired by stir-fried Manicai with eggs. It is very easy to prepare and very well received especially kids. To find out health benefits and more on moringa plant do refer to early post-Moringa Oleifera - Miracle Plant ? 1. Wash the leaves thoroughly. Place the leaves on chopping board and dice into small pieces. 2. In a mixing bowl add in the diced leaves, eggs, soya sauce and pepper. Mixing well with chopsticks and set aside. 3. In a wok/pan, heat about 2 tablespoons of oil. When is hot, pour in the egg mixture. Once the eggs are starting to set, give it a stir. Continue stir-fried till turn golden brown. Dish out and serve! Hi Vivian! I don't know if I can get morinaga leaves but it sure looks like a tasty dish. Anything with eggs agrees with me! These eggs look delicious! I'll try anything made with eggs. This is the first time I've heard of moringa leaves. This moringa is the same as mani cai? Apple presently is made up of Rhapsody as an app, which is a superb commence, still it is now hampered by way of the incapability toward retailer regionally upon your iPod, and has a dismal 64kbps little bit selling price. If this adjustments, then it will somewhat negate this comfort for the Zune, but the 10 tunes for every month will nevertheless be a significant in addition within Zune Pass’ favor. making this kind out of post.